Jean Hardin's parents bought a home in Pass Christian at 729 E. Beach Boulevard in 1926. It became the family summer home for the five Hackett children as they romped the Mississippi Sound. Although the residence was sold in 1955, Jean still holds many happy memories of the Hackett family place. "It's a tale of Rip Van Winkle," Jean states, as she glories in happiness for having moved back after a 20-year elapse. In 1975, she found that not much had changed inspite of Hurricane Camille. With nostalgia in her heart, one day she began doodling while recalling glimpses of the way she remembered the Pass in 1930. By nightfall, the result was a wonderfully produced pen and ink panoramic sketch, which had unfolded before her. It was a reminder of Pass Christian as it was before Highway 90's rerouting along the beachfront. Her black on white design-work depicts the happy mood of yesteryear which Jean now shares with all of us. She has donated her puristic pictorial to the Tricentennial Committee as a funtastic fundraiser and as a contribution to the heritage of the community. Jean is married to the Rev. Durrie B. Hardin, Rector Emeritus of Trinity Episcopal Church, Pass Christian. Actual Photo of the same approximate area. 1965 View of the same area. Camille's Vengeance was bitter to the area in 1969. The mammoth Live Oak of Pass Christian died of "old age" in the 1950s. 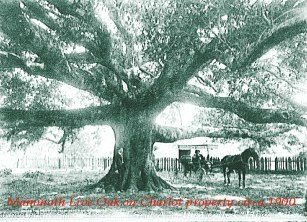 It was located near the intersection of Second St and Seal Ave.
--- was then, the largest Oak in Mississippi. Seal Avenue was first called Hog's Alley for the many hogs that ate acorns beneath the huge live oak.